Lowsunday is a Pittsburgh based band that play a combination of melodic Shoegazer pop and heavy rockin', but ambient floating, 80's styled pop-rock. The band originally released this CD in 1999 when they were known as Lowsunday Ghost Machine, but are now reissuing it since being signed to the Projekt label. The band consists of Shane Sahene on guitar and vocals, Shawn Bann on guitar and keyboards, Bobby Spell on bass, and A T Vish on drums. To expand on the opening description, Lowsunday have an 80's sound similar to early U2 (circa Boy), and Modern English come to mind too given that throughout this disc I was often reminded of their song that goes, "I Stop The World And Melt With You". But Lowsunday also have a heavy rockin' but ambient sound that is typical of Shoegazer bands, though they're far more energetic than the sounds that Shoegazer might bring to mind. Lowsunday's real strength lies in the dual guitars of Sahene and Bann who can crash hard in a wall-of-sound style that is dreamily melodic, but manages to be high energy while retaining a floating quality. Songs like "She Follows Rain" and "Shine" are among the tracks that brought U2 to mind. But it's the music itself that summons this analogy, as Sahene's vocals set the band in their own realm by retaining a dreamy yet eerie feel that certainly isn't heard from Bono. I like the combo. "Alone Without" has an 80's pop feel and this is the song that most reminded me of Modern English. But it's to Lowsunday's credit that they create far more interesting guitar work, especially due to the varied interplay between Sahene and Bann. "Closer Closer" is a solid example of the band's blend of aggressive guitars and floating melodic pop. And "To Sleep" is probably my favorite guitar track on the CD. Sahene and Bann play distinct parts, one keeping a solid grinding rhythm and the other playing trippy spacey psych licks. Lowsunday excel at melodic pop music but they can clearly jam when they want as well. In summary, Lowsunday are headed in a pop music direction, but manage to do so without sounding too formulaic, and have achieved an intriguing dual guitar combination that keeps the pop element interesting and varied. For more information you can visit the Lowsunday web site. Contact via snail mail c/o Lowsunday; PO Box 10651; Pittsburgh, PA 15235. Hear song samples at the Lowsunday MP3.com web site. 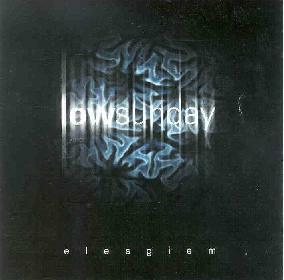 "Elesgiem" is distributed by Projekt. You can visit their web site.